The Rambo DX 55" Arcade Machine is a 2 player, gun shooting game from Sega brings all the action from the popular movie franchise to life! The game follows the story of the Rambo movies: Rambo First Blood Part 2 and Rambo 3 - allowing players to fulfil their dream of being Rambo. The game features include a Rage gauge which fills up by defeating your enemies. When the gauge is full, you will become invincible for a short amount of time. The Rage gauge also gives you a temporary power up to your machine gun fire when you press the action button. All of the action takes place in a Deluxe Cabinet, running on Sega's well-known Lindbergh system. The game uses the same cabinet and gun as the one used in House of the Dead 4, however this deluxe cabinet has been modified for this release and features great graphics and a Rambo marquee sure to grab attention. All the action can be enjoyed on the massive 55 Inch LCD screen! This exciting and thrilling game, with it's instantly recognizable license, will attract players from all across the floor, time and again. The Rambo DX 55" Arcade Machine is a 2 player, gun shooting game from Sega brings all the action from the popular movie franchise to life! The game follows the story of the Rambo movies: Rambo First Blood Part 2 and Rambo 3 - allowing players to fulfil their dream of being Rambo. The game features include a Rage gauge which fills up by defeating your enemies. When the gauge is full, you will become invincible for a short amount of time. The Rage gauge also gives you a temporary power up to your machine gun fire when you press the action button. All of the action takes place in a Deluxe Cabinet, running on Sega's well-known Lindbergh system. The game uses the same cabinet and gun as the one used in House of the Dead 4, however this deluxe cabinet has been modified for this release and features great graphics and a Rambo marquee sure to grab attention. All the action can be enjoyed on the massive 55 Inch LCD screen! This exciting and thrilling game, with it's instantly recognizable license, will attract players from all across the floor, time and again. Game play footage of Rambo arcade game from Sega taken from the AM show 2008. 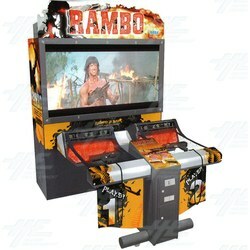 Rambo Arcade is an exciting shooting arcade game that truly lives up to the Rambo legend. Unlike many on rail shooters, there is not cover system, and the light gun is an automatic assault rifle with a large ammo clip, so you may literally spray your foes with bullets just as John Rambo would. This video was captured in-house at Highway Entertainment straight from the arcade machine's Sega Lindbergh game board. Rambo Arcade is a legendary arcade shooter that will give you a fix of excessive violence. In the words of the game: "He will never be forgotten, so long as we tell his heroic tales." Rambo Arcade is an exciting shooting arcade game that truly lives up to the Rambo legend. Unlike many on rail shooters, there is not cover system, and the light gun is an automatic assault rifle with a large ammo clip, so you may literally spray your foes with bullets just as John Rambo would. This video was captured in-house at Highway Entertainment straight from the arcade machine's Sega Lindbergh gameboard. Rambo Arcade is a legendary arcade shooter that will give you a fix of excessive violence. In the words of the game: "He will never be forgotten, so long as we tell his heroic tales."